Play Battleship Online for Free! Command your fleet and rule the seas! Seek and sink your enemy's ships before they find and sink yours! Unlock hidden super weapons like torpedoes and heat-seeking missiles to launch a firestorm of destruction. There are more ways to play, so fire away! 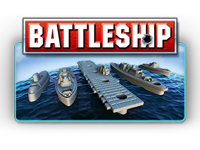 Play Battleship and other online board games. Pogo.com offers over 100 free online games for hours and hours of exhilarating game play! It's the classic BATTLESHIP experience you know and love. In this version of BATTLESHIP you get as many shots per turn as you have ships. Conquer 10 locations around the high seas, as you unlock new weapons along the way! You can get extra tokens for each ship afloat. Act quickly to destroy all enemy ships before they destroy yours! Conquer the seas! Sink enemy ships before the find and sink yours! Play Classic - it's a classic Battleship experience. Play Salvo mode - you get as many shots per turn as you have ships. Play Campaign mode - conquer 10 locations around the high seas, as you unlock new weapons along the way! The smallest ship is 2 squares long. Use that information to search the grid efficiently. You can switch between Salvo Mode (multiple shots per turn) and Classic Mode (1 shot per turn) under the Option menu when the game hasn't started yet. Even if you don't win a particular game, you can earn score and tokens just by playing. Misses deduct scores. Plan your shots wisely. You can get bonus scores by keeping your weapon unused.